From the files of The Gazette January 9, 1997. Shortly after I began to write this column I featured John Murray Anderson (1886-1954), the Broadway producer who was born and grew up in Newfoundland before moving to the United States. Anderson's younger brother, Hugh, was an equally accomplished Newfoundlander, acclaimed as a writer of stage plays, and as a valued assistant to his brother in New York. But it seems even less people know about the brother than knew about John Murray Anderson. Courtesy of the Centre for Newfoundland Studies, Memorial University of Newfoundland, St. John's, NL. From Who's Who In and From Newfoundland 1937 (St. John's, NL: Newfoundland Butler Co. Ltd.) 197. Hugh Abercrombie Anderson was born in St. John's in 1890, the son of John Anderson and Amelia Murray. His father was a prominent businessman who served on the St. John's City Council, as a Member of the House of Assembly and a Member of the Legislative Council, and is credited with being the major force behind the introduction of Daylight Savings Time to Newfoundland. Hugh Anderson received his early education at Bishop Feild College in St. John's before following the path of many other young lads of his social class: he was sent to Europe in order enhance his education, first at the Edinburgh Academy in Scotland, and later in Switzerland and France. After this tour of Europe he returned to St. John's and in 1909 joined his father's business. He remained there until 1915. With the outbreak of the First World War in August 1914 many young Newfoundlanders were quick to join up to serve King and country. 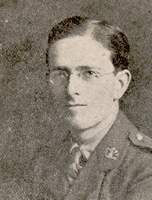 Anderson joined the Newfoundland Regiment in 1915 and was soon in England, but medical problems prevented him from seeing service at the front. Instead he worked in the Pay and Record Office in London. In 1917 he was promoted to lieutenant and in 1918 to captain. In 1919 he was awarded an MBE in the military division for his war service, one of only nine members of the Newfoundland Regiment so honored. Courtesy of Archives and Special Collections (MF - 147), Memorial University of Newfoundland, St. John's, NL. After the war, in 1919, Anderson returned to St. John's and his father's business. He became involved with the newly formed Great War Veterans' Association and worked hard for improved benefits and pensions for returning veterans. He was soon restless, however. His older brother, John Murray Anderson, had, in 1911, gone to the United States, where he was involved in the New York theatre and with motion pictures. In 1921 Hugh decided to join him, eventually becoming his business manager and associate producer. During their lengthy collaboration they produced 29 major Broadway musicals. From 1926 to 1929 Hugh directed a New York theatre school; some of the students were Bette Davis, Joan Blondell, Katherine Hepburn and Paul Muni. In addition to his involvement in the theatre as a producer and teacher, Anderson was a prolific writer. He wrote plays directly for the stage (The Mermaid Tavern, Queen Elizabeth Looks in her Mirror, Auld Lang Syne), and dramatized others for the stage from works already published in another form (Robert Louis Stevenson's novel The Suicide Club). He was writer in collaboration with his brother of the latter's biography, Out without my Rubbers: The Memoirs of John Murray Anderson as told to Hugh Abercrombie Anderson, published in 1954. He also served as secretary and president of the Canadian Club of New York, and wrote a book on the history of that club entitled The Kinship of Two Countries, published in 1964. For many years he served as editor of the quarterly publication of the Canadian Club of New York, the Maple Leaf. He also wrote hundreds of sketches, short stories and poems. While Anderson spent the remainder of his life in New York, he was a somewhat regular visitor to Newfoundland. On a return visit in 1955 he addressed the St. John's Rotary Club. Anderson married Sybil Irene Bartlett in 1917 but the marriage ended in divorce; he later married Lillian Bradley: there were no children from either marriage. He died at his home at Forest Hills Inn, Queens, New York on Nov. 9, 1965. Archives and Special Collections is fortunate to have a small number of items documenting Anderson's life and work. 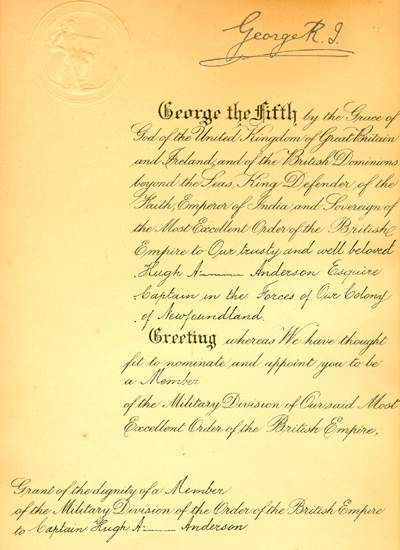 One is the certificate awarding Anderson the Military Division of the Order of the British Empire. A second is a typescript of Anderson's play, The Mermaid's Tavern, copyrighted in 1929. It is a one-act play with music, set in the Mermaid Tavern in London during the winter of 1592-93. The major characters are Kit Marlowe, Will Shakespeare and Ben Jonson. Anderson gave this copy to Gilbert Higgins some years ago; Higgins presented it to the archives in 1995. The rest of the items are clippings and reviews of his work, mainly containing biographical information, and a copy of a poem Anderson wrote entitled "Damming the Strait of Belle Isle."